This is my custom scenario for game Age of Empires 3 title "Makhikoi Episode 3 - Aztecs and Natives Coastal Clash". As everyone knows, Age of Empires 3 was created by Ensemble Studio some 10 years ago. 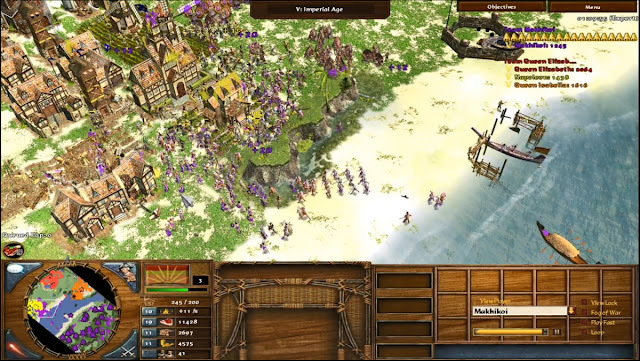 Age of Empires 3 is very popular RTS (real time strategy) game. The game have been released with two Expansion Packs. The first expansion pack is The Warchiefs. In this expansion pack, there are new Native American Tribes minor civilization. In total, there are 19 Native American Tribes settlements where we can access via custom scenario editor. 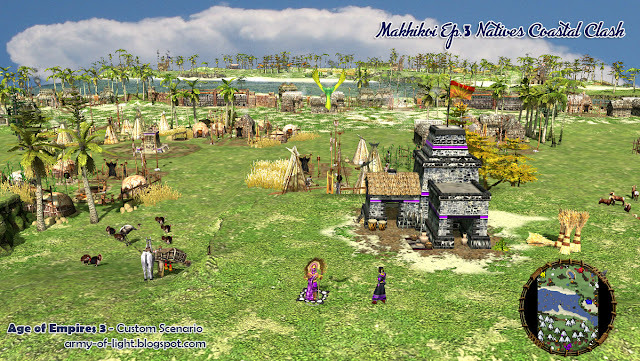 In this third scenario, Makhikoi is a War Chiefs to the Aztecs. This is a risk-free, calm scenario where your area are separated by a sea to the enemies. The question is how fast can you build up army to attack three European camps across the ocean. In your area, all nineteen Native American Tribes are present. 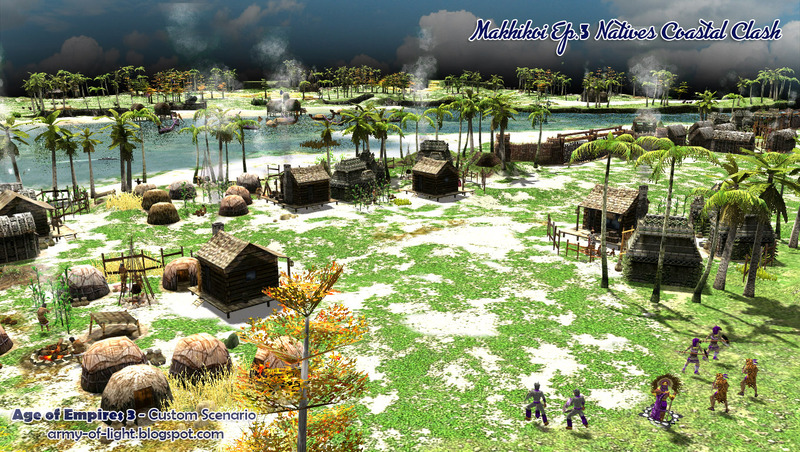 You should build up all Nineteen Native settlement to be able to use their units and technologies. 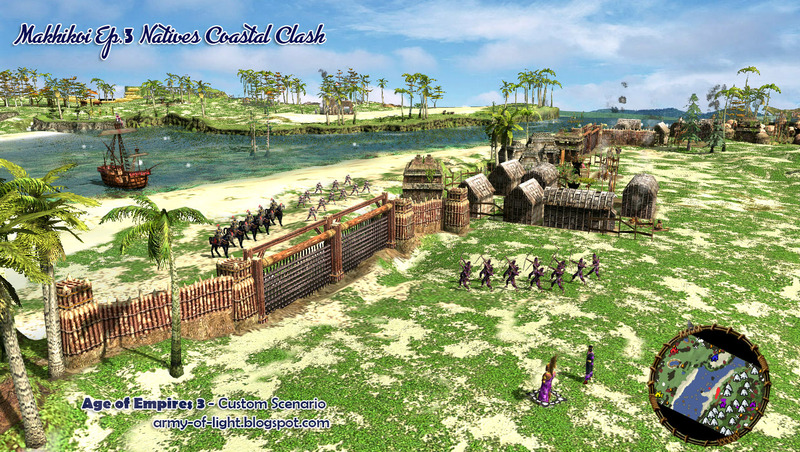 The three enemies will wait for you with their huges armies, so you'll need extra units from the Native Tribes. 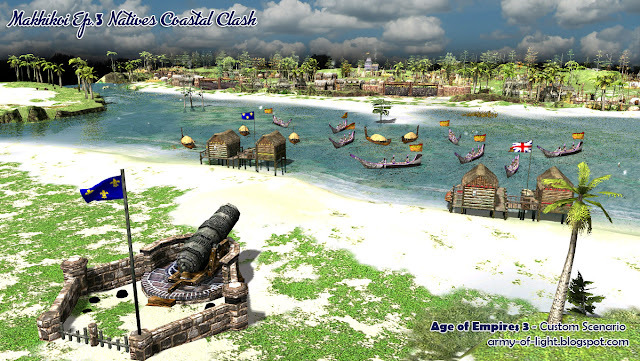 - Copy attached file "HomecityX_Makhikoi3.xml" to folder "..\Age of Empires III - Complete Collection\bin\Campaign\War Chief". This is default folder that contained all homecity for Warchief Expansion Campaign. This folder location can be varied depends on where you install your Age of Empires III files. Warning , if you failed to copy my intended files into that folder, your home city deck will be nulled. - You can set up your own home cities by copying the whole text in your Aztec Home City (in Savegame\sp_Tenochtitlan_homecity.xml) and copied it into that HomecityX_Makhikoi3.xml files. Just learn the tag and set it up. Expert. You will never die in this custom scenario. The enemies across the sea will keep growing until certain numbers. See how fast you can send army to defeat them. 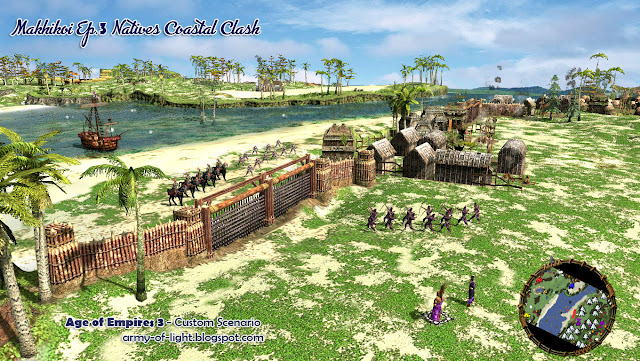 Initially, I was trying to design a scenario in the style of "Bunker's Hill", where Player 1 surrounded and must survive the attack of enemies. Until halfway I realized the standard AI uncapable to handle a water map and will never crossed their military. I since then altered the whole concept and made it into this scenario. I will use the initial concept for the next episode (it will be episode 5...because episode 4 will be another type of concept). So, this is kind of in-between scenario, a bonus scenario where Player 1 will only accounted on how fast he can finished the map. It will be interesting if you change the AI to be able to cross the water, then it will be a different game! 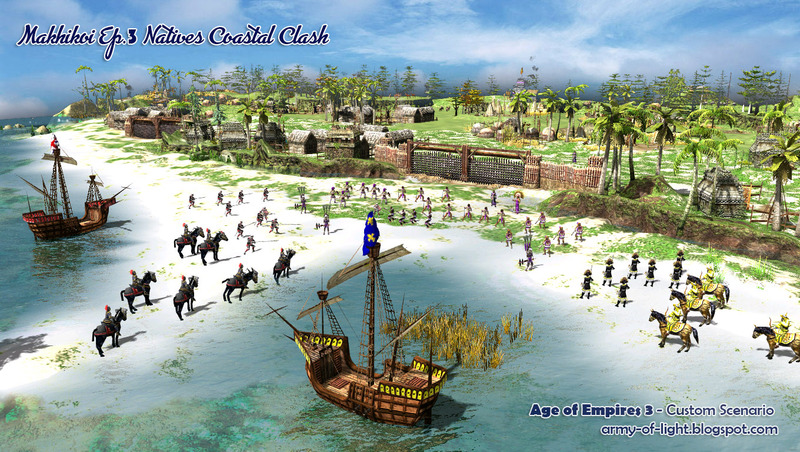 The Aztecs coast is under attack! 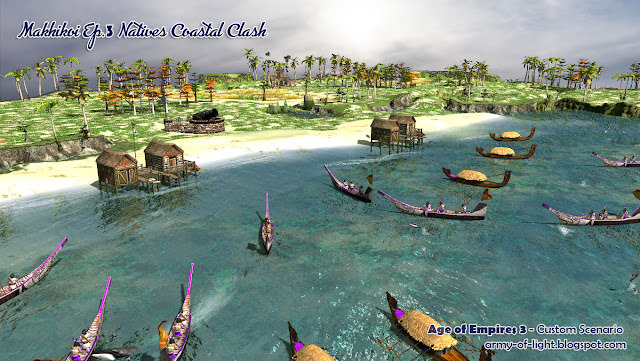 Defend our coast the mighty Arrow Knights!